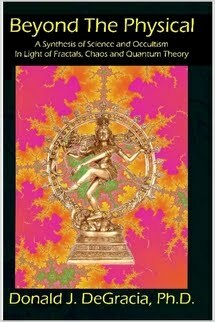 Beyond the Physical, A synthesis of science and occultism in light of fractals, Chaos and Quantum theory. The Western mind is enamored -nay - hypnotized with what it perceives outside of itself. But for all its knowledge of the outer world, the inner world of consciousness is but a hazy, half-felt realization in the life of the so-called "modern" person. Beyond the Physical seeks to go inside, and shed light on the relation between the inner and outer worlds of our human experience. Beyond the Physical surveys both classical and contemporary Western occultism in the context of developments in modern science over the past several decades. For example, the ancient Hermetic "law of correspondence" is shown to be a pre-scientific view of self-similarity as found in fractal geometry. Similar types of analysis is performed for such occult ideas as auras and thought-forms, showing how these ideas reflect resonance processes. Perhaps the most important discussions revolve around expanding the Western idea of "matter" to reflect ideas about "non-physical" types of matter, ideas with a long and venerable history in Eastern thought. Hence, "beyond the physical". "Beyond the Physical reveals our insatiable curiosity with those profound questions of our existence: It's about our morality, our psychic nature and power, our science and art and literature and psychology. Beyond the Physical guides us in most illuminating ways along highly creative paths of interior and exterior discovery. This book is an excellent inquiry."